A roomy, sturdy and stylish open tote bag. With a teardrop shape, Ethel veers away from the usual boxy tote. It's a “stuff it in and run out the door” kind of bag, designed to comfortably sling over your shoulder. There are a few slip pockets for the small things. For cat lovers, you'll also love this Cat Tote Bag. Love this! Have you ever used double sided quilted material, or would that even work with this? Hi Sharon, sorry for the late reply. I’m not sure about your question since I didn’t design this particular pattern. Perhaps give it a shot and see how you go. Please do let us know how it turns out. Thanks Mayra, I have downloaded and printed the pattern. Hope to do this during the holiday break. I love the fabric, where do you find such a gem? Hi Carla, I really like that one too. Perhaps best to ask the pattern designer on her Craftsy page. Unfortunately, I don’t know where this comes from, but the designer most certainly will. Can you please share the answer here if you learn something? Can you share a source for the fabric? Hi Karen, sorry for the late reply. Perhaps best to ask the pattern designer on her Craftsy page. Unfortunately, I don’t know where this comes from, but the designer most certainly will. Thank you for these lovely free patterns. Thanks for all that you do for us! You have a great blog and offer so much help and information. Hope you all have a very Merry Christmas! This is exactly what I have been searching for on the internet for the last 2 weeks! Thank you so much! 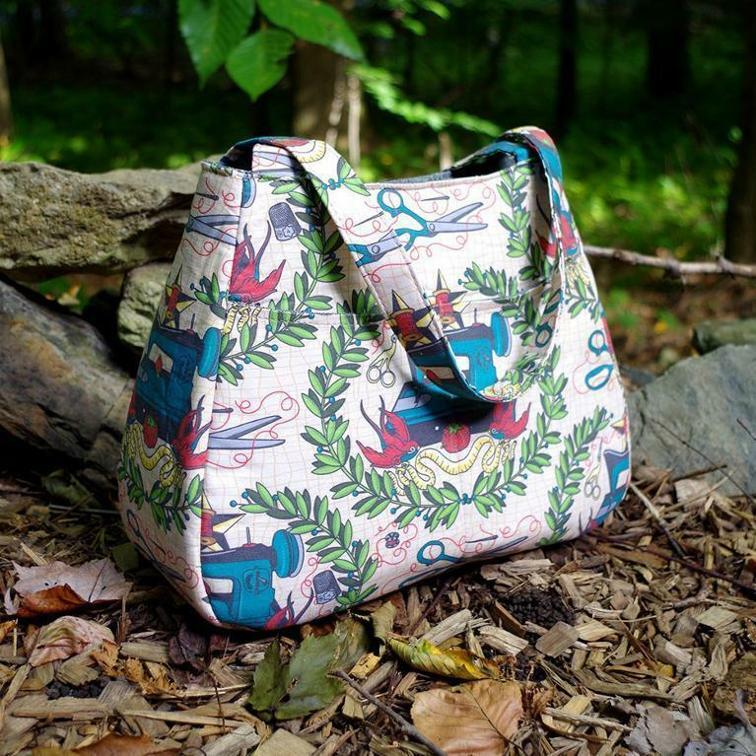 I needed a bag pattern that would have room inside, show off a printed fabric piece, and would not be too difficult to make and THIS IS IT! How do I get this free pattern and Sewing tutorial free? Hi Mona, please just click the big purple button at the bottom of the post. That will take you to Craftsy where the pattern is hosted.